Rev. William Lies, C.S.C., vice president for mission engagement and church affairs, and South Bend Mayor Pete Buttigieg will offer remarks, and awards will be presented to adult and youth learners, volunteers and community partners. Two Notre Dame vocal groups, Harmonia and Echoes, will perform at the celebration. Robinson Shakespeare Company members Brian LeBron-Williams and Paul Ferguson will also recite the Shakespeare monologues they are presenting at next month’s State Monologue Competition in Indianapolis. The Robinson Shakespeare Company is celebrating its 13th year of productions with a cast ranging from third- through 12th-grade students. The company produces two Shakespeare plays every year, and sends select students to a state-wide monologue competition. The company was the subject of Notre Dame’s Student Film Festival documentary “Much Ado After School,” which won the Audience Choice Award. The anniversary celebration will feature a viewing of the documentary. Since its founding in 2001, the RCLC has expanded to reach more than 500 adult and student participants each week, and its outreach programs impact thousands of South Bend/Mishawaka youths every year. The center boasts 300 weekly college student volunteers who tutor and mentor the RCLC students, and many community volunteers who support the RCLC’s efforts. The center, located at 921 N. Eddy St., provides local students with numerous programs to help them develop educational and cultural knowledge. This year, the RCLC’s Afterschool Program provided 70 students with daily tutoring and enrichment activities. The program sent 20 students to Washington, D.C., to enhance their knowledge of American history. The RCLC’s Literary Corps tutored 150 elementary school children across six different locations. RCLC programs include the Take Ten conflict resolution program and RCLC Youth Entrepreneurs. 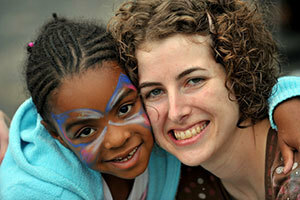 “None of (the RCLC’s programs) could be accomplished without the strong relationships developed over the past 14 years. It is impossible to overestimate the impact of the 300 college student volunteers that participate in RCLC programming, and of the many partners that have collaborated with us to provide ongoing educational opportunities for our community,” said Jennifer Knapp Beudert, manager of the Robinson Community Learning Center. Originally published by Catherine Ake at news.nd.edu on February 18, 2015.